Dredging and the management of dredged material has been an important function of the U.S. Army Corps of Engineers (ACOE) since its inception. The ACOE maintains channels and harbors at appropriate depths for commerce and public safety. EWTS provides ACOE certified Dredged Material Inspectors (DMI) for the New York and New England ACOE districts. DMI are required monitoring personnel for all ACOE dredging contracts that require at sea disposal of dredged material. EWTS personnel are dually certified as DMI and also approved by NOAA’s National Marine Fisheries Service (NMFS) as Endangered Species Observers. This dual certification also facilitates cost efficiency for Dredging Contractors. 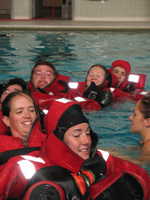 All EWTS DMIs have prior experience working aboard commercial vessels and understand the rigors of at-sea life. EWTS DMIs are available at on short notice, for short or long term contracts.